Even if you were studying all night before or couldn’t fall asleep pondering where to get more student discounts on food and clothing, you still have to wake up early enough to have breakfast. I know, it is so easy to make (or even buy) a cup of coffee and run off to college. But do you realize that having or skipping breakfast has a direct influence on your mood and the way your day will go? Secondly, while you are struggling to concentrate on what your professor is saying, your stomach acid is working hard on the walls of your stomach. I am sure you have heard that if you don’t eat, the acid that is meant to digest the food that is not there still does its job, and your stomach gets hurt. Why do it to yourself if even small things like a bowl of cereal or a cup of fruit helps to avoid it? Third, food gives you energy. When you don’t eat, you usually feel powerless and what’s even worse, you bring your bad mood to people around you. You feel easily irritated, angry with others for no reason and probably, do something you will later regret. This, too, can be easily avoided if you eat before you leave home. You may argue, of course, that you don’t feel hungry when you wake up. If this describes you, then you are, in most cases, guilty of snacking late at night, when your stomach is not prepared to digest food. When I learned that the food is broken down easier during the day than throughout the night, I made it a rule to eat no later than four hours before I go to sleep (it’s good to never eat after 8pm; however, if you study in the evenings and come home after that, then make sure that you don’t have dinner right before you head to bed). My problem is also that when I fill my stomach, I suddenly become active, and I often have a hard time falling asleep. Just by giving up late snacking, I managed to lose a couple of pounds, improved my sleep and became accustomed to waking up in the morning craving for breakfast. Let’s say this was persuasive enough, and you are now convinced that your breakfast is a must. What should you eat? It all depends on how hungry you feel and whether or not you like to eat a lot in the mornings. Note that the best strategy is to include a piece of fruit into your every meal, and breakfast is no exception. Your other options may be a light sandwich or a toast with butter, jelly or a slice of cheese, or a cup of oatmeal. I got so used to making quick oats that I hardly ever bother to cook hot oatmeal anymore, even though nothing is easier than that. All you have to do is to bring some water or milk mixed with water to boiling, and then stir oats into the boiling liquid. Make sure to stir thoroughly while cooking, and then cool off your culinary masterpiece, and enjoy it. It is much healthier to make your oatmeal from scratch rather than boil water for an instant one, but if you have little time and no other option, that will do as well. By the way, quick oats are usually more expensive than those that you have to cook, so if you make it a habit to make your breakfast in the morning, this may add up to your student savings. Not only is it cheaper to buy a big box of farina (it’s a great breakfast meal as well, if you like the taste), it also saves you from buying a danish or a doughnut while at school, which are fattening and expensive on campus. Another quick morning meal you can easily make is an egg platter. Two or three eggs your way with sausage, salami, or a beef frank is my usual choice. The greatest discovery for me was Hebrew National salami, as if you go to your local deli and ask them to slice it a little bit thicker, you can fry it on a pan with no oil, in its own fat. Brown it for two to three minutes and serve with eggs or on a toast. As far as toasts are concerned, if you have a toaster, you can always brown your bread and eat it dry or with butter. If you don’t have the equipment, though, you can put some milk into a bowl (you can mix an egg into it as well), and then dip a slice of bread into it. After doing this, brown your bread on a pan, and it will be soft, fresh and tasty. From my experience, pancakes usually take a long time, so I usually make them when I’m not in a hurry, as I am not a big fan of quick mix packages. I mix flour, two eggs, a tablespoon or two of vegetable oil and a half cup of milk adding some yeast to it. It is best to let it stand for an hour, and then start cooking. It is a time-consuming breakfast, though, and I seldom have time for it. All in all, no matter what you prefer to have, you should always eat something in the morning before leaving. Just remember that breakfast is a must, as a good start defines the way your day will go. 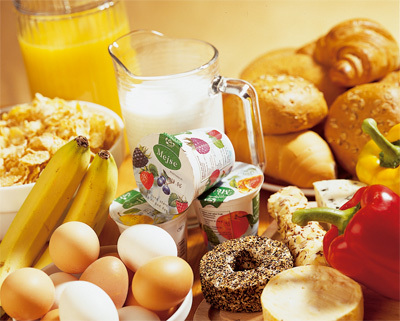 Therefore, begin your morning with something you and your stomach enjoy, and energize yourself for great deeds. 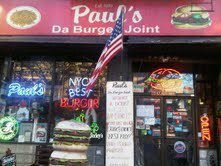 On the verge of its 22nd anniversary “Paul’s Da Burger Joint” located at 131 2 ave (at the corner of 2 ave and St.Marks), a family-run business that was established in 1989, keeps serving delicious and affordable burgers to the neighborhood diners who know all the servers and managers in the place and feel at home amongst welcoming tablecloths with red and white checkers on tiny tables, and also tourists appearing at the joint during different seasons looking for the best burger in town. And here they find it, indeed. Being the house specialty, ½ pound beef, turkey or vegetarian burgers make up 90% of all food orders. Just looking at the juicy patty tempts one to bite into it right away, ripping apart the soft fresh bun that serves as a great body for the meaty “soul.” Choose the right cheese, add lettuce, tomato, and onions – and you got yourself a filling lunch or dinner. The size is just right: it neither lets you go home hungry nor leaves anything to bring home in a doggy bag. Once you bite into it, you will not stop chewing until it’s gone, so good it is. 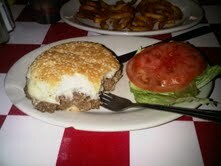 And the price is just right as well: $7-8 on average for a burger depending on what you prefer to have on it. Out of the house’s large variety you may be willing to try St. Marks, a special cheeseburger topped with mushrooms and fried onions, or the diners’ favorite Eastsider, a bacon cheeseburger with ham, mushrooms, tomatoes and onions; those will be a little fancier and more expensive. Even though food prices increase as we breathe, the owner, Matt, insists on keeping the cost of burgers on the same level. “I’d better have more customers and make less money than have less people and charge them more,” he says. It is believed at “Paul’s” that the main thing is to supply the customers with high quality burgers that don’t cost them an arm and a leg. Understandably, though, not everyone is a burger lover. There are plenty of choices left for you, if you are one of those. For instance, you may opt for a chicken or fish fillet sandwich, or an Italian sausage hero with peppers and onions, or a beef frank with sauerkraut. Having a lot to choose from, you may be sure to find something that will satisfy your empty stomach. And if it’s big and craves for more, accompany your sandwich with a side of curly and slightly spicy cajun fries, sweet potato fries or crunchy onion rings. And if you are a student, there is a new special just for you, so you should put it on your student savings list. 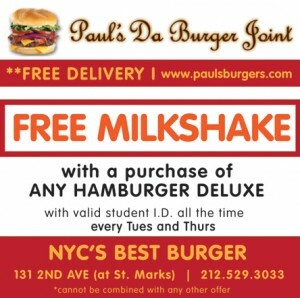 If you visit “Paul’s” on a Tuesday or Thursday at any time, buy any burger and show your student ID (what can be easier), you will get a complimentary milkshake. Choosing between vanilla, chocolate or strawberry, you might as well go for a “Michael Jackson,” the mixture of the first two. The milkshake is the greatest student discount you can get anywhere, as it is a creamy, delicious full-size dessert that will complete your meal and satisfy your sweet tooth for free! Having started as “Paul’s Palace,” the restaurant is definitely not the dwelling of kings, but it may become your next favorite eatery on the East Side. After all, it takes only one try to make it your regular stop-by. Walking into Reserve, on 3rd Ave between 28th and 29th, I felt all the chaos and exhaustion of my day melt into the warm, red walls. A low light hovered over each table, with wine bottles stacked in every which direction. Even the bottoms of bottles protruded from the walls around the bar in the back, somehow without cluttering the small restaurant, but tinting the ambiance with the theme: a Thai inspired wine bar. While Thai restaurants are known for spicy foods in cozy nooks, Reserve adds an unexpected twist to the Thai experience: wine. I’m sure you’ve been to a number of Thai restaurants and been remiss about the quality of beverages, well, partner Luck Watanasuparp felt the same way. Luck’s family owns a number of Thai restaurants throughout New York, including All Luck and Thai Select, but this is her own venture in the restaurant business, at which she is doing amazingly well and loving it. Luck wanted to pair the four flavors of Thai food: Spicy, sweet, sour and salty with fine wines that would enhance each other when combined. The restaurant serves over fifty different wines, all within affordable ranges with a few higher priced bottles tossed in. Reserve has been open for less than a year now in the Gramercy neck of the proverbial woods. Tucked among hot clubs and loud joints with drunks bouncing and stumbling out the doors or shouting from in between the cracks in the walls, Reserve is an oasis. It’s small, quiet, and personal. This is the perfect place to bring a date, or close friends when you want to sit down with a little background music and a lot of great food. If you’re looking for something exciting and loud, why not head to Reserve for dinner as a calm before the storm? The service is four star, with the shock of street cart prices. Before glancing at the menu, I assumed that it would be a stressor on my limited funds, but was pleasantly delighted to find that it’s cheap. I don’t mean New York City cheap, which is irrelevant to the rest of the world, but Kansas cheap, Mississippi cheap. I once ate a large, amazing meal at the Ajax Diner in Oxford, Mississippi for eight dollars, and this brought me back to the economy of the south, inducing a school girl giggle at the prices. I’ve spent more money on dirt, have I made my point? I brought two close friends of mine with me for dinner, and we lived like kings. We started with a Losen Bockstanz Resiling, a sweet wine, and paired it with spicy beef, duck wraps, and crab cake tapas. Everything was tender and cooked to perfection. The duck wraps, rich, fatty duck wrapped with fresh veggies in a flour tortilla roll, sushi style, was paired with a thick, sweet sauce. The large crab cake, enough for the three of us, was surrounded by three elegant sauces. The spicy beef was mixed with equally spicy and salty sautéed veggies. We indulged in a mango salad, larb pizza (with chicken and melted Mozzarella) and a curry green pizza. We ate slowly, discussing the flavor combinations and our awe at the portions. For very little money, the three of us left full, but not overstuffed, and feeling like we ate a healthy meal that tickled our tastes. Our cheeks blushed from the sweet wine as we walked out in a euphoric daze. If you’re feeling bogged down by the sometimes treacherous city, tired of the rain and cold, and never having enough money to go out, Reserve is the place to go. It will pick up your spirits without draining your bank account. Long Island or Jersey commuters can even walk from Penn Station on their way home from work or class. Keep Reserve on your list, because you simply can’t miss out on all it has to offer for the economically challenged taste buds that require more refinement. We all know that sugar isn’t great for you, but recently there has been a lot of media on the evils of sugar. I’m not going to say having a little sugar in your coffee or tea will kill you, but if you read the nutrition labels of your food and drinks, you’ll find an astonishing amount of sugar. According to dietary guidelines, the allowable amount of sugar per day is around 32 grams. Weakens Your Immune System: We know vitamin C keeps you healthy and helps your immune system fight off viruses and bacteria. Now, imagine sugar as the villain of this story, fighting for a place and pushing vitamin C down the staircase of your immune system. Sugar makes you sluggish as it weakens your body’s ability to maintain itself. Diseases Associated with Sugar: Heart disease, obesity, diabetes, sugar can also aggravate asthma, and even mental illness. Sugar, for obvious reasons, can show increases in mood swings and changes in personality. Imagine, your happiness hindered by something that makes your taste buds swim. Would you rather have a brownie, Mountain Dew, or a good day? It’s a vicious cycle, because when you’re feeling low, sweets are your first craving (for most people), and they make your body suffer in turn. Sugar has also shown to increase the amount of yeast in your body, as the yeast feeds off the sugar and multiplies, leading to issues like liver disease, among many others. What to do! : There’s no way you’re going to cut sugar out of your diet (because it’s physically impossible) and you can’t toss the sweets completely, just take it easy and be aware of how much you’re consuming. If you’re conscious of your sugar intake, I can guarantee that you’ll be better at limiting it. First off, don’t waste the taste on drinks. Stick to water, sugar free drinks, and avoid juices pumped with extra sugar. Read your labels, ladies and gentleman! Save your sugar for when you can actually taste it. Also, there are simple sugars that are okay to consume, like in fruits, vegetables, and honey. Try to stick to these when you’re looking for a treat, and maybe use honey or a sugar free sweetener in your coffee or tea. Just remember, you’ll feel better if you consume less sugar, and you won’t have those angry sugar crashes that make all day feel like nap time. Don’t skip desert when you go out to dinner, or avoid your local bakery because you’re terrified of diabetes, just learn to limit your sugar intake to a reasonable amount. Try counting how much sugar you think you’ve consumed, based on labels, for a day or two. The first day count up what you would normally eat, and the second day eat based on how much you should be consuming and see how you feel on both days. What have you got to lose? Check out Associated Supermarkets to find a healthy alternative to sugar, or some sugar-free snacks. 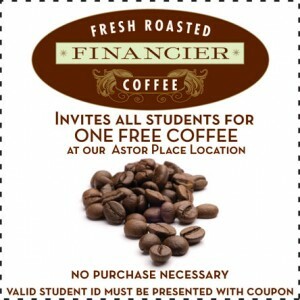 Or try Whole Foods for some great student discounts! Looking historical and shabby, “Stromboli Pizzeria” located at 112 University Place does not attract new customers… until they actually try the pizza. How many times have you been told: appearances deceive? They have authentic pizza with variety of toppings and now new student discounts – two things that would definitely draw you to the place had you known about them. What’s the student savings deal? 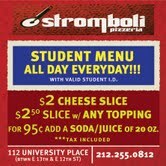 How about $2.00/slice or $16/pie for a plain and $2.50/slice and $19/pie for one topping with your student ID? How about a fountain soda for 95c? Note that this includes tax as well. Knowing that the students are a category always willing to save money, the pizzeria’s management caters not only to their stomachs, but to their wallets as well. How good is the pizza? The place was open since 1966, and the recipes haven’t changed, even though there is a new owner. The dough is soft and fresh, whether you choose white or whole wheat, the fresh mozzarella is yummy and ricotta is so tender that its texture seems to be close to that of whipped cream. Most pizzas are made with homemade marinara or tomato sauce, or, for pizza topped with ricotta, no sauce at all. Whole wheat pizzas come plain with cheese or topped with vegetables keeping the healthy trend. 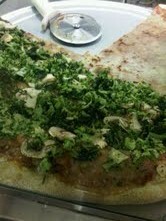 You can order mushrooms, spinach and broccoli and extra sauce if you’d like to make it juicier. Contrary to the popular opinion that whole wheat pizza is not as tasty as regular one, Stromboli’s whole wheat dough is just as delicious as white one, so if you, like me, switched from white to wheat bread long ago, this is the way to go. Interested in trying new flavors? Try Pizza Pesto, a slice with ricotta, fresh basil and homemade pesto sauce, juicy, cheesy and flavorful one, or Caprese with fresh mozzarella, fresh tomatoes, fresh basil and tomato sauce (most ingredients are fresh, so don’t be surprised). For good quick snack, try the house’s invention, “the wheel,” a small palm-size roll filled with mozzarella and ricotta. It comes vegetarian with spinach or, for carnivores, with ham and pepperoni, and it’s perfect to snack on if you are short of time or are not really hungry. You can eat it as it is or request some marinara sauce for dipping. If you not a pizza lover, you can go for a hero or calzone, or get delicious garlic knots made of soft pizza dough with fresh garlic on top. Don’t forget to satisfy your thirst with a Snapple, a special-priced fountain soda, a cane sugar Coca-Cola or Ginger Ale from Boylan. If you are craving unusual flavors, try a Key Lime, Cherries’n’Cream or Cream Soda from Stewart’s. So don’t be afraid of appearances, as Stromboli is going through a renovation, and soon the pizzeria’s exterior with match the quality of the food, appealing to both your physical and visual taste. 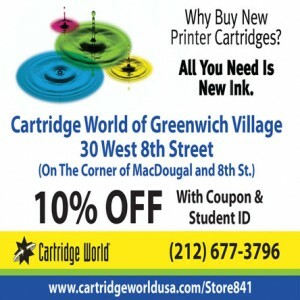 Also Check Out Great Campus Clipper Student Discounts! Download our NEW App on iTunes. Become a fan on Facebook and follow us on twitter and watch our YouTube videos. Don’t forget to sign up for our bi-weekly newsletter for student promotions and coupons and download the coupon booklet NOW. One glance at the Tanti Baci website, or menu clearly indicates a “love nest” perfect for sharing dinner and a glass of wine with any loved one. (The restaurant’s name even means “lots of kisses” in Italian.) But I was most drawn to the effortless way Tanti Baci provides an escape from the well-beaten sidewalks and bustling streets to your grandmother’s living room. There are snatches of tables along the brick walls and corners of the dining room. 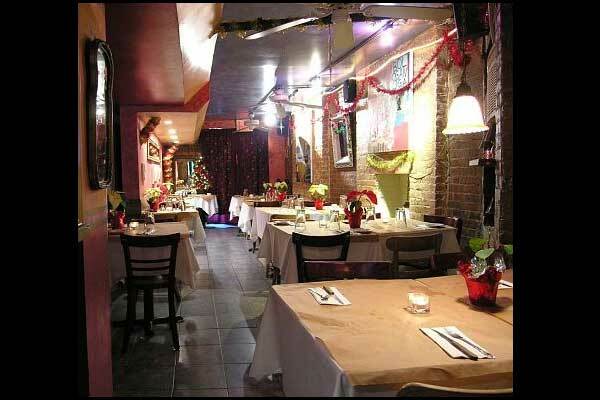 The pink twinkle lights of the window display give a rosy hue to the entire restaurant. Simmering sauces and aromatic garlic made promises from the kitchen. My first visit to Tanti Baci was with my boyfriend Valentines week and I immediately saw the date-potential for any pair of pasta lovers. The owner, Sam, greeted us warmly and handed us menus part English, part Italian with flowing script. I started off the meal with an arugula salad with sweet slices of pears and salty slivers of parmigiano cheese. When I asked Sam what the best entrée to order was, he told me that all of the pasta listed on the menu were hand-made and that I could not choose wrong with any of them. The chefs use original Southern and Northern recipes from the old Italian country. The pastas are part of the year-round menu, where the list on other entrees such as grilled polenta and sausage, chicken breast sautéed in lemon cream, and vegetable lasagna and are updated daily. In addition to the list of pastas, the menu has an ornate list of sauces that may seem overwhelming, But never fear! The waiters are prepared with friendly suggestions of what best compliments each other. While waiting for the main courses my boyfriend and I couldn’t help notice the Italian love ballades that were playing on the speakers. I again felt that I was in the home of my make-believe Italian grandmother and that I was hearing her watching her stories in the kitchen while making our meal. My Ricotta Cheese Ravioli arrived peeking through the bright red homemade tomato sauce. The sauce was incredible. I could taste the sweet from the carrots, freshness from the basil and the time and affection the chef gave the sauce. My boyfriend ordered his pasta in the Bolognese sauce, which came out creamily pink and I could clearly taste the meat it was simmered in. We finished the meal splitting a homemade Tiramisu with coffees. The portion was perfect for two and the ladyfingers with mascarpone cheese left me feeling lighter than the coco powder on top. Many Kisses are not a guarantee in bringing a date to Tanti Baci, but you will find an ideal meal and setting to cozy up with someone you love. Click here for more information on Tanti Baci. Given a choice between Design of a Newspaper Page (or something similar to that) and Public Speaking, I chose the latter without hesitation. I have always loved to speak in front of large groups, despite the fact that I often trembled inside. I can manage my nerves well, though, and I enjoy delivering my message; therefore, I was eager to learn new skills through this class. Unlike me, there are many students who are petrified to take a public speaking class because they hate standing in front of people and talking to them, or simply because they believe that they will never need speaking skills for their career. If this sounds like you, let me assure you: whatever your future profession will be, you will definitely have to make presentations, whether you like it or not, so why not learn it as early as possible and be prepared? 1. Everyone is nervous while speaking in public, no matter how confident he or she looks. Even your professors feel tension inside. It is just not comfortable to face a large group of people and have their eyes and ears turned at you. 2. Developing your public speaking skills means learning how to control your fear and delivering your message successfully. The more often you practice what you learn, the more confident you will feel delivering every other presentation, so you should use every opportunity to talk in class, whether it is a formal report or a mere answer to someone’s question. 3. No matter how interesting your presentation is, it is always hard to listen if there are no visuals, and don’t you hope for a “first-time student discount” (meaning that the audience will not sympathize with you even if this is a debut). Therefore, you should always do a short Powerpoint presentation, prepare handouts or simply draw a poster. Anything works, as long as there is some kind of visual back up for your presentation. If there are names that the audience may not know, you should write them on the board, especially if their pronunciation is not well-known. When your listeners see the information in front of them, they understand it better and remember it longer. 4. There is more than one type of audience: friendly, indifferent, neutral, and hostile. The easiest kind to deal with is the neutral one, as they are the material that you can work with. You can tell them whatever you want, and it is up to you to keep them interested. Friendly audience is not as easy as you suppose it is because these listeners usually know who you are and think highly of you, so there is no way you can deliver a presentation that is not as strong as your previous one. Otherwise, they will easily get bored and won’t pay attention. The hardest task is to engage an indifferent audience, as they are not interested in your topic, or you, and will most likely sleep through your presentation. As far as hostile audience is concerned, they are the most fun group to deal with, as it is your job to change their mind about you or the topic you are talking about. You have to be well-prepared and predict what kind of questions may be asked and what the audience’s objections will be. Knowing the type of audience is a must, as it helps to deliver the message in the most effective way. It can be compared to researching on student savings: you should know before you go which place may give you the best deal and how to get this deal from them. 5. Eye contact is powerful. If you stare at your notes, or, what’s even worse, read from the page, no one will listen to you. People will automatically assume that you are poorly prepared and have no idea what your presentation is about, and feel like listening to you is a waste of time. A good idea is to create an outline (on a piece of paper or index cards) with major points you are going to make. Write down quotes from experts, if you are using any. With this material, you can spend more time looking at your audience to study and react to their facial expressions and gestures. For example, if they look confused, ask if they want you to repeat or clarify what you said. If they yawn, you should probably give them an interesting piece of information that you were saving for later. 6. Once your presentation is ready and your outline is completed, you have to practice. You may need to record your voice, listen to it and repeat your presentation in front of the mirror at least 5 to 10 times, so that when the actual presentation takes place, you will be well-prepared and less nervous. Later on, when you become more experienced, you won’t need much practice. Still, 5 times is generally recommended. Just imagine how awed your classmates will be when you deliver your well-rehearsed informative presentation! 7. And finally, always leave time for questions. You may hate to be asked, but how else will you know that your message was understood and remembered? This is, perhaps, the most exciting part, as through the questions you can see whether your presentation was clear, what you should improve on and how the message was taken in general. The time you should put aside for questions is usually 3-5 minutes, so there is nothing you should really be scared of. I’ll state it plainly—I don’t know how to dance. I discovered that I suffered from the disability of possessing two-left feet during elementary school gym class. 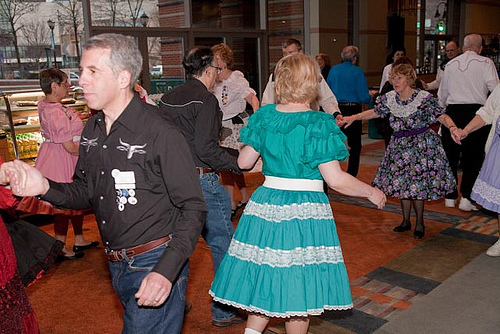 Our gym teacher, a formidable and muscular woman named Miss Bea, who had a graying mullet and graying Nike tennis shoes, gathered us together near the bleachers and declared that we would be square dancing today. I had never heard the words “square” and “dancing” in the same sentence, so I had no idea what Miss Bea was talking about. The look of disconcertment on my face must have caused her to single me out. Needless to say, our demonstration turned out to be a disaster, mainly due to my “disability.” The eight of us arranged ourselves in a square. My partner, Kyle, gave me a pleased but cheesy grin, a grin that quickly turned into a grimace as the demonstration wore on. Kyle’s red high tops were stepped on, his glasses were knocked askew, and he might have somehow got elbowed in the ribs. My partner probably suffered more injuries due to a square dancing demonstration than he would have if Miss Bea had sent us outside to play contact football. Once class ended, I slunk away as quickly I could. Thankfully, next period was lunch, where I could lock myself in the girl’s bathroom and bemoan my lack of finesse on the dance/gym floor. Fast forward fourteen years and I’m still no Ginger Rogers, though I do know how to square dance! I’ve considered taking a dancing class to improve my skills, but have never been able to muster up the courage. What if the instructor declares me hopeless? What if, through some twist of fate, Kyle reappears from my past as a dance student? However, the Sandra Cameron Dance Center has me reconsidering my hesitation. Located down in trendy SoHo, the Sandra Cameron Dance Center offers instruction for Tango, Salsa, Ballroom, and Swing. The staff is awesome, the classes are fun, and instruction is offered on all levels, whether you’re a beginner like me, or a virtuoso who wants to hone his skills. Sandra Cameron offers classes every weekday, so you’re sure to be able to fit it into your hectic school schedule. But best of all, the classes are affordable! A single month-long course costs only $80! And with this awesome student discount, you’ll be saving even more. Save $25 off any course with your student ID. 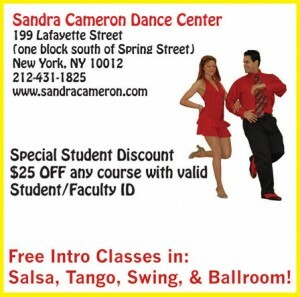 I know I could benefit from taking a class at the Sandra Cameron Dance Center. If I ever happen to run into Kyle again, he’ll be glad I did! This time, I’ll sweep him off his feet amidst the hay-bales at our local square-dancin’ barn. There are a number of medical and psychological studies that tell us how helpful our pets are. Sure, you may not consider your dog eating a new pair of shoes and drooling on your pillowcase while you’re at work to be beneficial, but they will make you live longer. While most dogs aren’t the Lassie type, I know mine is afraid of boxes, tape, the vacuum, broom, mop, crinkly bags, the iron, plates, and a variety of nonsensical household paraphernalia, but studies show that they lower blood pressure and pet owners tend to live longer than non pet owners. This isn’t why most people decide to get a pet, but it’s a definite perk. Even a fish, however small and seemingly insignificant, can feel like company in an empty apartment. We dog lovers tend to border on obsession. I know that my fiancé and I have to check ourselves on how much we talk about the dog (our spunky Husky mix, Hera) to our friends. Being away from home for twelve hours a day sometimes, I have to say I miss her terribly. When I get home, she has been fed, walked, and is now passed out by the front door waiting for my arrival. I hate missing out on all the daytime fun. Maybe the best way to quench this dropsy like thirst is to attach Mattel’s recent seller, the Radica Puppy Tweets. Puppy Tweets is a water resistant, motion detecting key chain like device that attaches to your dog’s collar and transmits to a USB device you plug in to your computer. Set up a twitter account for your dog with the device, and it will draw from a database of responses (albeit sometimes hokey) that correlate to your dog’s movement, or lack thereof. 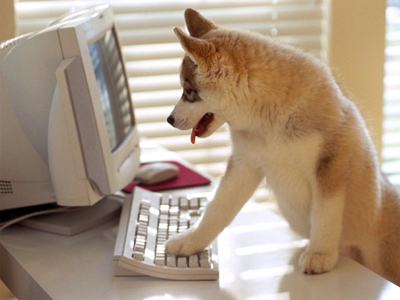 Check it from your computer at work, or follow your dog on your smart phone’s twitter app. If you can’t have a pet, due to dorm living, a cranky landlord, or an allergic spouse, or a lack of funds, you can always log on to watch a few of the constantly streaming puppy cams. These are surprisingly popular, and reduce stress and anxiety for quite a large population. So, if you’re having a bad day and can’t make it to a local shelter to pick up some puppies, why not log on to streaming puppies all day! Visit My Blog and follow me on Twitter! Wear Yellow: It is the happiest color, after all. This is Martha Stewart’s suggestion, and I thoroughly promote it. So, it’s not time for your spring line to come out, why not tuck a little yellow into your wardrobe? How about a yellows tie with your button down, a few yellow hair clips, even yellow underwear (after all, it’s really for you!). The things that other people can see can spread the smiles. If your dorm, apartment, or workspace is a little dreary, why not bring a yellow soaked photo, or a few little yellow plants to brighten it up! Just Dance: Get your heartbeat to match some pop music and really kick it up. Space is sparse in this city, but you can move a few tables, grab an ihome, and put on some dance tunes for a little party. Even if it’s just you and a hairbrush dancing in front of the mirror, make it happen and you’ll expend a little energy towards your own joy. Give: It’s always good to remember that there are others out there who have it worse than you do. After all, you’re probably getting a college degree and have a roof over your head, so you’re already blessed. Volunteer at a shelter, soup kitchen, or outreach program. You don’t have to be a big brother or big sister, but giving just a little bit can be great. Get some friends together and make a little gift basket for a person you frequently see struggling. Not a people person? Volunteer at an animal shelter, you’ll get some furry love for your attention, which is my favorite kind. Move Around: Make time for you and your beau to take a nice, long walk in a new neighborhood. Getting some fresh air, even if it’s cold, can be a real pick me up. No beau, drag your best friend out of the apartment, and if they’re unwilling, offer them a small prize for the outdoor exercise. No friends? Get an extra gig as a dog walker. You may have to pick up a little poo, but you’ll get paid to take a pooch out for an hour. Even if these things don’t do it for you, making the conscious effort to mix it up a little and get out of your every day slump can brighten your cob-webbed endorphin transmitters.